Jambul, as the coach of the youth team - tell us about the struggle of juniors and youth, did new strong guys appear? - There were many new young sportsmen. Also those from whom we expected high results took part. The newbies pulled well, and I hope that they will also show a high result in European and world championships. I do not want to guess in advance, but I hope for their good result. Are there obvious favorites who claim to medals in European and world championships in the new team? - Yes, according to the result of the championship we have a national team, both among youth and juniors, and among senior athletes. As always, the first and second number in each category will represent Georgia in international championships. There are also favorites, these are the sportsmen you already know and I would also like to mention the category of up to 90 kg, Tornike Gigauri, who won 4 gold medals, 2 in youth and 2 senior class. I hope he will be very well this year. So, we definitely have guys who will qualify for medals, everything will be seen in the upcoming championships. Before the European Championship there are almost 3 months left, is it enough to recover after the national championship and improve the shape? - We wanted to hold these competitions as early as possible, so sportsmen would have enough time to recover and prepare. In many countries, national championships are held in March-April, so our athletes will have more time. What can you say about senior classes? Were there any sensations or prizewinners were predictable? - In general, the first and second numbers remained the same - they are sportsmen who have been representing Georgia for more than one year. 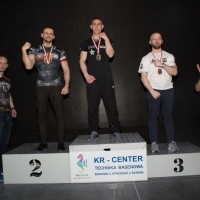 There are athletes who moved from the junior category to the category of senior athletes - Alex Zaurashvili pulled at the senior championship and won gold on the right hand in the category up to 65 kg. Zurab Tavberidze moved to the category of up to 85 kg, he also pulled very well, like his brother Beka Tavberidze, who took gold in the category of up to 80 kg. In general, there were no big sensations, but there were new guys. I want to wish all our athletes luck in the upcoming international championships and hope for their good result. Placido Marco Gioco: "I am satisfied with Vendetta"